Xan Burley in “X”. Photo by Scott Shaw. In a place like the Green Building, it’s hard not to think about the transformation of space. Tucked away on the upper bank of the Gowanus Canal, this former brass foundry has found new life as a performance venue with room for imagination. It’s soaring ceilings and concrete floor are largely unembellished (save for two chandeliers hanging over a stretch of dance floor); there are no stage wings mystify the off-stage action, and no backdrop to invoke a different time or place. In this spartan industrial box, you are left to your own devices. Until the performance starts, that is. As the lights concentrate on the dance floor, the Green Building’s expansive space comes into focus. A Noguchi-like set – two thick posts set in the back corners, connected at 90º angles to taut white strings that extend out into the audience – brings a familiar definition. Here is a stage, a room for dance, the suggestion of separation between performer and viewer. Xan Burley in “Room Moving (Part I).” Photo by Scott Shaw. Thus begins Room Moving (Part I), a new performance piece by The Median Movement, the collaborative choreographic effort of Xan Burley and Alex Springer. Though it would not be wrong to call this piece a dance, it offers so much more than pure choreography. 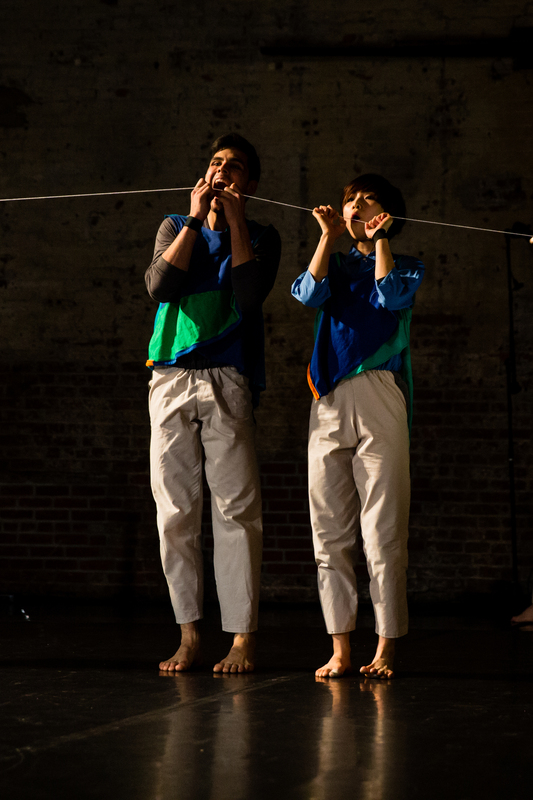 Joined onstage by dancer Hsiao-Jou Tang and the work’s sound and set designer, Will Owen, the quartet embarks on an experiment to use their bodies, voices, and those feeble strings to continually create and destruct their environment. Tiny microphones strapped to the insides of the performers’ wrists lead to the creation of an incidental sound score. Once a sound is recorded through the microphones, like the swoosh of an arm through the air or the tapping of hands on the floor, it is processed into a loop. By the end of the piece, the surrounding sound is an aural history of the movement just witnessed. With the strings defining the space at the outset, the dancers take to the interior. Their blue and green shirts, reminiscent of sports pinnies, suggest that this roped-off square is a playing field, and it is up to us, the spectators, to figure out the rules of the game. With scientific specificity, they meticulously explore every combination of people (two duets, one solo with a trio, etc) in all corners of the space. As the movement continues, sometimes a performer is swept into joining the choreographed phrase, or else released from the group to pursue their own path. Though the movements themselves are refined and straightforward, Burley and Springer make small moments seem momentous by keeping in mind the holistic organization of the space. 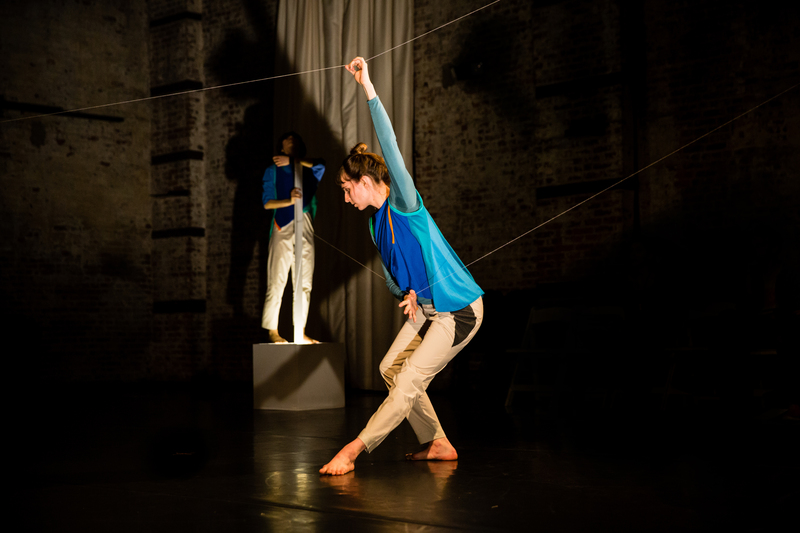 As two performers dance a unison phrase downstage, one adjusts the sound loops at a computer far upstage, and the fourth checks how the strings attach to their stanchions, we see that the performers rely on each other to make their individual tasks meaningful in the scope of the greater composition. 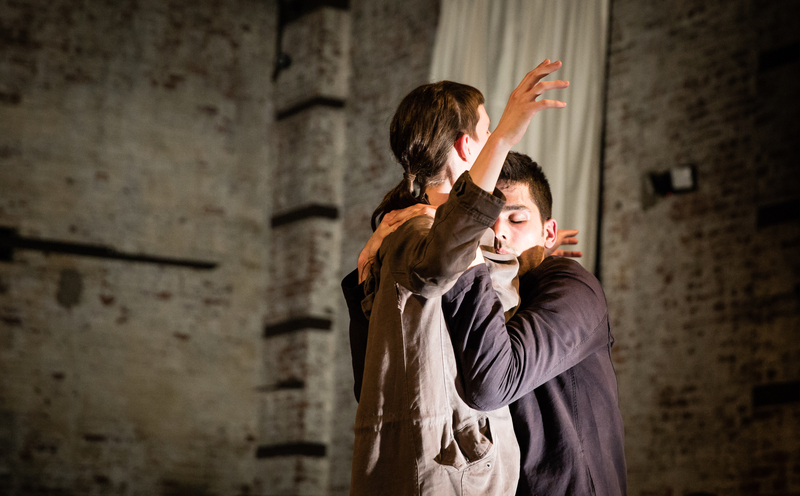 Alex Springer and Hsiao-Jou Tang in “Room Moving (Part I).” Photo by Scott Shaw. As the piece progresses, the interior starts to bulge. As the layers of sounds collect and magnify, the performers start to quite literally push against the strung boundaries of their enclosure. Those white strings are no longer walls; once Burley takes one end in her hand and pulls it to center stage, it becomes a mobile vector, slicing through the space to redefine its edges. Upstage, Springer and Tang pick at another still-taut string with their teeth, reiterating that it is just another means of using motion to create sound. The the pace was a bit slow at times, the gradual swell of sound, movement, and space synced up quite nicely. By the end of the work, it is apparent that any previous perception of separation between the performers and their audience was a contrivance. We are interdependent, and the scheme of performance consumes everyone in the building. Intermission was followed by a change of pace. In X, a duet, Burley and Springer show their prowess as story-tellers, evoking potent images of love and loss that struck a universal empathetic chord (I saw tears more than once from my fellow audience members). Described by Burley and Springer as “an ode to an end,” the piece is beautifully nuanced, capturing the many states of being that are passed on the road of deterioration – competition, mistrust, aggression, the pretense of composure. The unison moments are bittersweet (here they are, so perfectly connected), while their physical challenges to each other (How much can you handle? How soon until you fail?) are tinged with tragedy. In many ways, the duet feels like a play or a film, in that it is easy to imagine the dialogue that might be passed between the two characters. The most poignant moment, however, is a pause. Standing side by side at the edge of the stage, Burley gives instructions to close your eyes and take your neighbor’s hand. Whether she is speaking to Springer or to the audience is uncertain, and she doesn’t stop to clarify. Since her eyes are closed, the audience scrambles to decipher her intention, and some of us bashfully put out a hand just in case someone will grab it. This moment reflects the heart of the piece – with eyes closed, things are fine and the dance goes on, but with eyes open, it’s one huge mess of jumbled expectations. In “X,” Burley and Springer capture the many states of being that are passed on the road of deterioration. Photo by Scott Shaw. 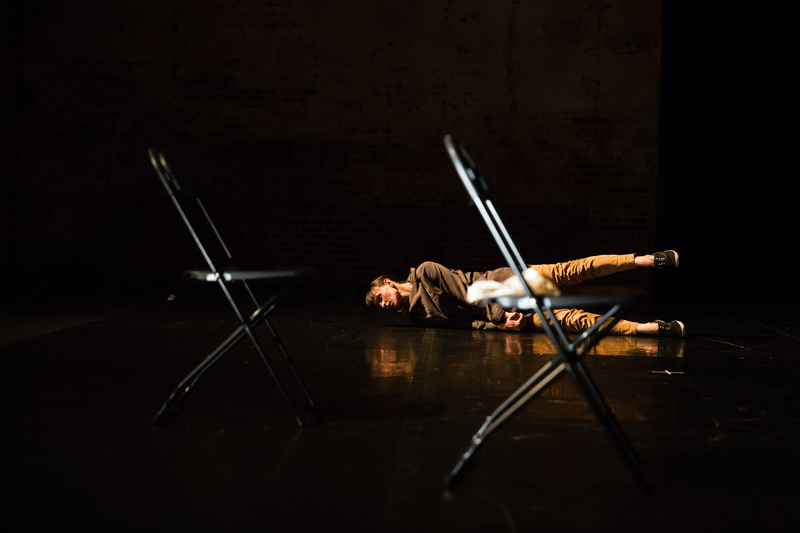 Compared to Room Moving, X includes more of the expansive, moving dance phrases that are expected from dancers who spend a lot of time around Doug Varone (both Burley and Springer have been in his company for a few years). Their fluid athleticism is invigorating, and as they run together, jump at each other, and throw themselves to the ground, they completely inhabit the work’s sense of self-preservation and determination to survive just through the end of this. Though The Median Movement is a young company (Burley and Springer have been working together under the name since 2008), they are certainly on the right track. They seem to have found the sweet spot where good ideas, good editing, and good performance intersect, and with those tools in hand, there’s plenty of room to grow.